I’m not a big fan of the whole microwave thing. I mean they take up heaps of space and most people rarely cook with them. But for years I kept one cluttering up my tiny kitchen because I thought I needed it for defrosting things from the freezer. It’s been years since I ditched my microwave. And apart from when my friends wanted to heat up some baby food the other night at my early Thanksgiving dinner, I haven’t missed it one bit. I especially haven’t missed the feeling when you’re defrosting raw meat in the microwave and leave it in too long so that the edges get overcooked while the middle is still icy. Ick. Most of the time I’ve become more organised. I get things out of the freezer the night before and let them safely and slowly defrost in the fridge, like a good food-safety-law-abiding citizen. There are still times when I forget or the plans change, but you’ll be happy to know even these trying circumstances don’t induce microwave-longing. If I want to defrost something like a soup or stew, I just run the bottom of the freezer container under the hot water tap for a little while, enough to loosen. I then deposit the frozen chunk into a saucepan and slowly allow it to defrost over the lowest heat. Too easy. Most frozen veg, like peas, are best popped straight into a pan with a little olive oil, or into a saucepan of boiling water. And I’ve recently successfully cooked two different sized turkeys on different occasions from frozen and ended up with the most wonderfully moist meat. The trick here is to use a low heat 160C (325F) and use a meat thermometer to make sure your bird reaches a safe internal temperature. If you’d like to learn more about this, I’ll be teaching this method in my Stress-Free Thanksgiving class this weekend. I thought meat and fish were more tricky, than tubs of soup, until I learned this wonderful new method. I picked up the idea from the food science book, What Einstein Told His Chef. Basically, things will defrost faster, the quicker their coldness is taken away from them. So you want a surface that will conduct heat to the frozen item (or take the cold away) as efficiently as possible. While a metal sink is better than a wooden bench top at conducting heat, the ridged surface means that only part of the food is in contact with the metal. Much better to use a heavy cast iron frying or roasting pan for the maximum heat/cold transfer. I recently put this to the test defrosting 2 similar sized scotch fillet steaks. One, I unwrapped and placed directly on my cast iron roasting pan. The other I left wrapped in it’s Styrofoam tray from the butcher. I turned both every 20 minutes or so. And the winner was undoubtedly the steak on the roasting pan which took about an hour to defrost fully. Whereas the other steak took about 3 1/2 hours to get to the same state. I love it when an experiment proves the point! watch lamb curry with spinach video on YouTube. Today’s recipe is a wonderful little Indian-inspired curry, Saag Lamb or lamb with spinach. Feel free to use frozen meat AND spinach, to try out the defrosting method. Along with my butter chickpeas, this is a favourite Indian inspired curry. I prefer it with lamb but chicken or beef are also good. For a vegan / vegetarian version of the curry, replace the lamb with tofu and equivalent amount of tofu or a can of drained chickpeas. Steamed potatoes would be another replacement as would cauliflower. Saag (spinach curry sauce) is also often served with paneer, an Indian cheese which is a little like a very firm ricotta. Feel free to serve as is or with a bowl of fluffy rice and a little natural yoghurt (possibly with some cooling grated cucumber stirred through). I also like to serve this with a salad dressed in natural yoghurt like the one below. If you aren’t sure how hot your chillies are, slice a tiny piece off the stalk end and touch it to your tongue. Don’t make the mistake I made years ago and nibble the tip of the chilli (it’s the least hot part) and end up adding way too much. 1. Combine gram marsala with 1 tablespoon olive oil. Toss in lamb to coat in the spiced oil. 2. Heat a large frying pan on a high heat. Add lamb and chillies and stir fry for a few minutes or until just cooked though. Remove lamb from the pan. 3. Add tomato and spinach and simmer for about 5 minutes or until it looks saucey. 4. Return lamb to the pan and bring back to a simmer. Taste and season, adding the extra garam marsala if you think it needs more spice. This isn’t traditional at all, but I love a good salad on the side of most of my meals. I often find a curry & rice extravaganza can be a bit lacking in the freshness department. This salad has it all, crunchy AND yoghurty coolness. 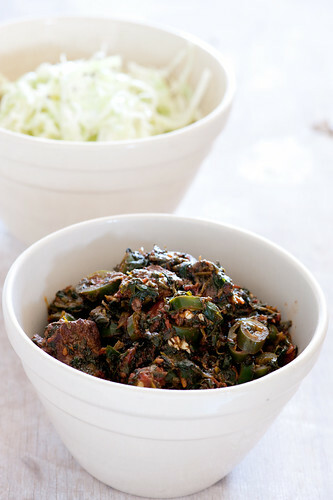 If cabbage isn’t your thing, try the dressing on baby spinach leaves or even on shaved cucumber. 1. Whisk together yoghurt, garlic and lemon. Season generously. 2. Remove outer leaves from the cabbage and slice the remaining cabbage as finely as possible. 3. 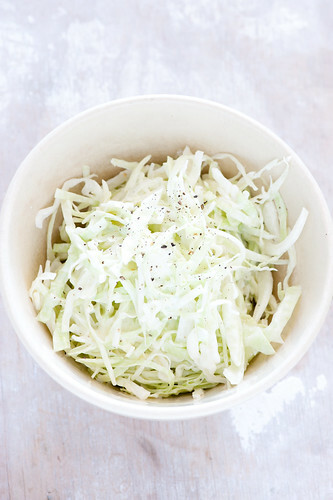 Toss cabbage in the dressing. Serve now or keep in the fridge until you’re ready. Curry and cabbage – may not be everybody’s cup of tea but it’s two of my favourite things (and now I feel all Julie Andrews – weird). Thought of you tonight when I made supper – wasn’t quite 5 ingredients but 7 wasn’t far off… and it was delicious. One question, though – If you’re cooking something as large as a turkey directly from the freezer, doesn’t it stay in the temperature ‘danger zone’ for a long time? I really resonate with this post. I got rid of my microwave a while back and don’t miss it one bit – I usually do the defrosting overnight in the fridge, but good to know about the other options. Thanks to not having a microwave, I’m far more organised with shopping and cooking and I’ll never forget the gross factor in getting the defrosted meat out of the microwave half cooked! These are great tips, thanks! What about the cold water method? Leaving a frozen item in it’s bag and immersing it in cold water? That seems to work, especially in a metal work bowl, but is it safe? I’m with you–the microwave is reserved for EXTREME defrosting emergencies. I hate the little rubbery bits it causes on the ends of my meat. My method is a large metal bowl filled with cold water. Not warm–cold. Change the water every 30 minutes. We use the water to water the plants so it’s not wasted. I can get home around 5:30 and have enough meat for 2 thawed and in the skillet or oven by 7.
finally! another non microwave user! yay! we haven’t had one for years and friends just can’t believe we live without a microwave! I just wouldn’t know what to use one for if we did have one though. yay for going microwave-free nova! your mum was onto something using the sink. the miracle defrosting tray – too funny. although you have to admire the entrepeneurial spirit! good question – apparently not – I’ve done quite a bit of research and seems that the heat penetrates relatively quickly so each part isn’t in the ‘danger zone’ for long enough to cause a problem. The other upside is that because you’re starting from frozen, the bacterial populations haven’t had a chance to start growing like they would during the defrosting period so your initial bacterial load is quite low. Which is a good thing. yay for cabbage and curry – it’s the business. and very happy that your 7 ingredient dinner was delicious. My mum always used cold water too. Seemed the quickest way. I just want to say that I love your blog. I’ve been reading it since this past summer and I love it. There’s an elegance to it. I love that you stick to minimal ingredients and don’t make things complicated. I hate looking at recipes with 10+ ingredients, I really don’t want to go run around my city at different grocery stores looking for for the ingredients like some cookbooks make you do. Thank you for making things easy. Most Excellent! As you may have read on my blog, I just purchased a large lamb and we still have 89 pounds left. What perfect timing! I’m printing this as we speak and will prepare it tomorrow (tonight is pizza night). Thanks so much, love you recipes. I use lightroom for basic editing and that’s it. great project – I grew up on a sheep farm and really miss having access to free lamb. Jules – what about the old (sheep farm) method of hanging the frozen shoulder of hogget on the clothes line to defrost it? I also miss having sides of sheep delivered to the kitchen and being able to portion it up generously. I don’t miss meat bags, “blowy-watch” and the mess though! We’ve never had a microwave (my husband used to be a physicist and electromagnetics was his particular interest – enough said). But if I am in a hurry to defrost something relatively small – or at least “thin” so it is not a long way to the middle – then I sometimes speed up the process by putting it into the fan oven with just the fan running and no heat. Works brilliantly with bacon if you are in urgent need of a sandwich and can’t prise those frozen rashers apart! It doesn’t fit with your five-ingredients approach, but I always include fenugreek and fennel seeds in my saag; also, I puree the spinach mixture before adding the cooked paneer or meat. 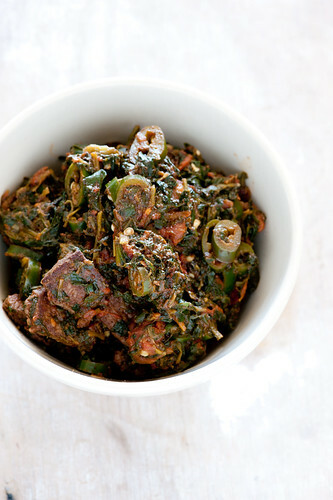 Saag is a great way to use up leftover roast lamb or chicken. 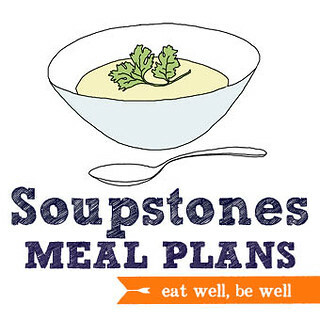 Also, try stinging nettles instead of spinach – it’s incredible! I’m addicted to my microwave … but only for my wheat bag! Just want to say i absolutely love your site. i read it every morning. there is something about the simplicity and freshness that sets it apart from other blogs. anywho, the curry looks fab. will try it tonight. i might add some lentils to it, just to get some more in my diet. also, where did you get your knife. it looks amazingly sharp. do you have to sharpen it often? lentils would be lovely with this curry. Thanks for that magical tip about a metal surface! That is worth remembering. Cheers. I use my microwave as a bread crock. Im a novice cook… really a novice and stumbled across your site and LOVE IT! I have actually been able to cook something (well 2 of your recipes this with chicken and butter beans and chorizo) and not been disappointed with my efforts! I feel empowered!